20cm x 30cm tin with baking parchment. In a small pan, gently heat the Stork and half the muscovado sugar until melted. Increase the heat and, once bubbling, add half the chocolate, stirring until melted. Simmer for 3 minutes, stirring constantly, until thickened slightly. Set aside to cool for a few minutes, stirring once or twice. 2. In a large bowl, whisk the eggs, remaining muscovado sugar, demerara sugar and vanilla until light and fluffy. Beat in the white chocolate caramel until smooth, before sifting in the flour and baking powder. Using a spoon, fold in with the remaining chocolate chunks, until just combined. 3. 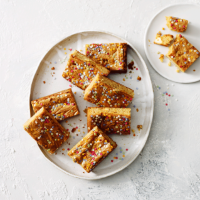 Pour into the prepared tin and sprinkle over the salt and fruity confetti. Bake for 30-35 minutes, until set and crisp on top but slightly wobbly in the centre; a skewer inserted into the middle should come out relatively clean. Cool completely in the tin, before cutting into 16 squares and serving. To serve as a pudding, warm through in a medium oven and top with vanilla ice cream.